Dr. Faythe Freese, Professor of Organ at the University of Alabama School of Music, is in demand as a recitalist throughout the United States, Germany, Denmark, South Korea and Singapore. 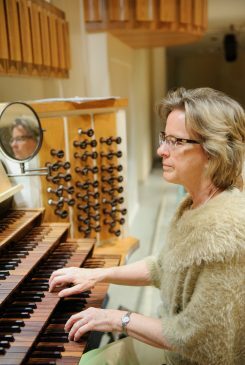 Dr. Freese is the first American woman to have recorded at L’Eglise de la Sainte-Trinité, Paris on the landmark instrument where Guilmant, Messiaen and Hakim were titular organists. Her fourth compact disc entitled, Faythe Freese à l’Orgue de l’Eglise de la Sainte Trinité, has received critical acclaim in The Diapason, The American Organist and Tracker Magazine. Her fifth compact disc, recorded at Magdeburg Cathedral, Germany, entitled The Freese Collection is Dr. Freese’s most recent release. The solo organ work entitled, The Freese Collection, a work by Dr. Pamela Decker, was commissioned and premiered by Dr. Freese in January 2013. Dr. Freese has also commissioned the following new works for solo organ: Passacaglia on BACH by Pamela Decker, To Call My True Love to My Dance by Naji Hakim, and Out of Egypt by John Baboukis. Dr. Freese lived in Magdeburg, Germany for over three months in spring 2015 during her sabbatical and played and performed on over fifty historic organs in nine countries. She collaborated with early performance practice experts such as Ton Koopman, Montserrat Torrent, Pieter van Dijk, Aude Heutermatte and João Vaz on period repertoire. Her most recent recitals upon her return incorporate the historic repertoire performed by Dr. Freese and accompanied by a slide show of the historic instruments upon which she performed in the spring. She was a featured lecturer at the 2014 American Guild of Organists National Convention in Boston, Massachusetts; and was a featured lecturer and concert artist at the 2010 American Guild of Organists National Convention in Washington, D.C.; the 2011 American Guild of Organists Region IV Convention in Greensboro, NC; the 2001 American Guild of Organists Region VII Convention in San Antonio, TX. ; and the 2011 Association of Lutheran Church Musicians Biennial Convention. Dr. Freese’s performances have been hailed as “powerful …masterful… impressive … brilliant.” Dr. Freese was also faculty and featured performer at the 2011 Boston Pipe Organ Encounter Advanced (POEA), the 2011 Birmingham POE, the 2012 Gainsville POE and the 2004 Atlanta POE. Dr. Freese holds degrees in organ performance and church music from Indiana University. She has held faculty positions at Indiana University, Concordia University in Austin, University of North Dakota-Williston, and Andrew College. As a Fulbright scholar and an Indiana University/Kiel Ausstausch Programme participant, she studied the works of Jean Langlais with the composer in France, and the works of Max Reger with Heinz Wunderlich in Germany. Her organ teachers have included Marilyn Keiser, Robert Rayfield, William Eifrig and Phillip Gehring. She has coached with Dame Gillian Weir, Simon Preston, and Daniel Roth.